You can be sure that when people began sharing music online, most observers didn't think that established business structures were threatened. Or that inkjet printers would supplant laser printing. Or that the introduction of transistor radios would not only doom large radio consoles, but also become catalysts for the extinction of most appliance stores. Understanding these disruptive innovations (so called because they literally disrupt existing business structures) is the key to successful innovation and sustained growth, according to the authors of this new best-selling book. The authors also write about spin-offs and product extensions, and the need for separate, autonomous business units to manage them, and the skills needed by managers to foster and exploit the disruption. In fact, they state, failing to heed this advice is an almost certain guarantee of failure. 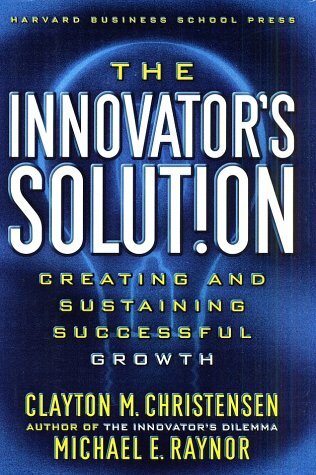 But The Innovator's Solution is an intelligent, perceptive (and frequently counter-intuitive) look at innovation, and well worth the time it takes to read and digest it to gain a greater understanding of the complex and profound combination of forces driving business development.